MCTV College News & Information	 Weekly informational video message from the President of Montgomery College. Dr. Hercules Pinkney's final video blog message to the Montgomery College community as Interim President. Embed "Montgomery College President's Video Blog Message #42" on your page. Weekly informational video message from the President of Montgomery College to the College community. Includes Dr. DeRionne Pollard's first speech at Montgomery College. Embed "Montgomery College President's Video Blog Message #41" on your page. Weekly informational video message from the President of Montgomery College to the College community. Includes Dr. Pinkney's acceptance speech for his 2010 Sandy Spring Bank Outstanding Leader Award at Leadership Montgomery’s 21st Annual Celebration of Leadership. Embed "Montgomery College President's Video Blog Message #40" on your page. Weekly informational video message from the President of Montgomery College to the College community. Includes excerpts from the Bliss Electrical School Reunion video. Embed "Montgomery College President's Video Blog Message #39" on your page. Weekly informational video message from the President of Montgomery College to the College community. Embed "Montgomery College President's Video Blog Message #38" on your page. Weekly informational video message from the President of Montgomery College to the College community. This episode includes the 2010 Faculty Award-Winners video. 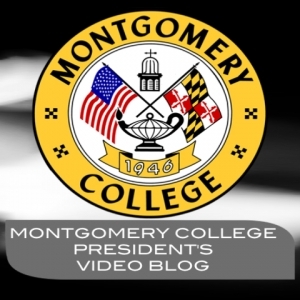 Embed "Montgomery College President's Video Blog Message #37" on your page. Weekly informational video message from the President of Montgomery College to the College community. This episode includes an end of year student reflections video. Embed "Montgomery College President's Video Blog Message #36" on your page. Embed "Montgomery College President's Video Blog Message #35" on your page. Embed "Montgomery College President's Video Blog Message #30" on your page. Embed "Montgomery College President's Video Blog Message #34" on your page. Embed "Montgomery College President's Video Blog Message #32" on your page. Embed "Montgomery College President's Video Blog Message #29" on your page. Embed "Montgomery College President's Video Blog Message #31" on your page. Weekly informational video message from the president of Montgomery College to the College community. This episode is Dr. Pinkney's 2010 Presidential Commencement Address. Embed "Montgomery College President's Video Blog Message #33" on your page. Embed "Montgomery College President's Video Blog Message #26" on your page. Embed "Montgomery College President's Video Blog Message #28" on your page. Embed "Montgomery College President's Video Blog #27" on your page. Embed "Montgomery College President's Video Blog Message #25" on your page. Embed "Montgomery College President's Video Blog Message #22" on your page. Embed "Montgomery College President's Video Message #23" on your page. Embed "Montgomery College President's Video Blog Message #24" on your page. Embed "Montgomery College President's Video Blog Message 19" on your page. Embed "Montgomery College President's Video Blog Message 18" on your page. Embed "Montgomery College President's Video Blog Message #21" on your page. Embed "Montgomery College President's Video Blog Message #20" on your page. Embed "Montgomery College President's Video Blog Message #17" on your page. Embed "Montgomery College President's Video Blog Message #16" on your page. Embed "Montgomery College President's Video Blog Message 15" on your page. Embed "Montgomery College President's Video Blog Message #13" on your page. Weekly informational video message from the President of Montgomery College. Embed "Montgomery College President's Video Blog Message #12" on your page. Embed "Montgomery College President's Video Blog Message #11" on your page. Weekly informational video message from the President of Montgomery Collegeto the College community. Embed "Montgomery College President's Video Blog Message #10" on your page. Embed "Montgomery College President's Video Blog Message #9" on your page. Weekly informational message from the President of Montgomery College to the College community. Embed "Montgomery College President's Video Blog Message #8" on your page. Weekly informational video message to the College community from the President of Montgomery College. Embed "Montgomery College President's Video Blog #7" on your page. A weekly informational message from the president of Montgomery College. Embed "Montgomery College President's Video Blog #6" on your page. Embed "Montgomery College President's Video Blog #5" on your page. Embed "Montgomery College President's Video Blog #4" on your page. Embed "Montgomery College President's Video Blog #3" on your page. A weekly informational video message from the President of Montgomery College. Embed "President's Video Blog 2" on your page. Embed "Montgomery College President's Video Blog" on your page. Embed "Montgomery College President's Video Blog Message 14" on your page.